In addition, Mr. Sherwin's ensemble work includes regular performances on baroque and classical guitar in the Musica Vera Duo, with baroque violist Mark Bailey. Mr. Sherwin has also performed with the Yale Collegium Musicum on theorbo, and various historical plucked instruments. He directed the New Haven Guitar Quartet, featuring students from the Yale School of Music, as well as performed at the Yale University Art Gallery with soprano Kathryn Aaron in a program of rarely heard Dutch Baroque music. He also regularly performs as baroque guitarist with the American Baroque Orchestra. Kevin Sherwin has been invited to give presentations at the following international conferences: Guitar Foundation of America International Convention and Competition (University of Louisville, 2018) - The Classical Guitar on Early Sound Recordings: Style, Expression, and Technique; Perspectives on Historically Informed Practices in Music (University of Oxford, 2018) - Conductors on early film: coordinating romantic-era orchestral expression; Historical Performance: Theory, Practice and Interdisciplinarity (Indiana University Jacobs School of Music, 2017) - The performance of baroque synagogal music in eighteenth century Amsterdam. He has been featured on the Metropolitan Museum of Art's Department of Musical Instruments online publication, in an article entitled "Giving Voice to Times Both Past and Future," discussing the collection's 1953 Ignacio Fleta guitar from a performer's perspective. Mr. Sherwin has worked as a performance practice researcher for the Yale Collection of Historical Sound Recordings, where he wrote various articles on Romantic-era performance practices, including on previously unexamined recordings of classical guitarists from the early 20th century. Mr. Sherwin is extending his work in performance practice further into the 20th century, serving as a researcher for the Charles Ives Society. In addition, Mr. Sherwin is newly active as a composer. 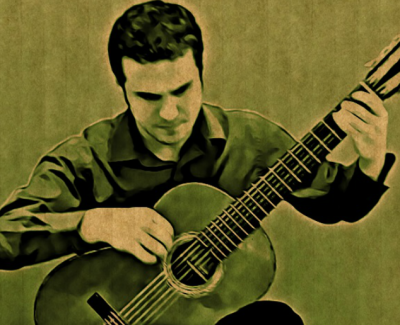 He has written several pieces for solo guitar, which he performs on recitals. As well, he has written special commemorative pieces for the Town of North Haven, Connecticut based on American colonial melodies, and a piece entitled "In Majestatem Gloriae" for two choirs, based on ancient Gregorian chant, featured on the Sundays at 5 Concert Series in Ansonia, Connecticut.